A strong, fun loving, world travelling, outspoken and politically active woman. Born April 5, 1921, died peacefully surrounded by family Tuesday July 3, 2018. 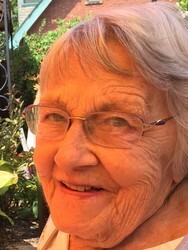 She was the beloved daughter of Pasha and Peter Wene; sister of George (Janet) and Leo (Cleo) Wene; mother of Robert (Carole) Hall; grandmother of Andrew and Victoria Hall and Alycia Whitney-Plaut; loving aunt of Cathy (Scott) Parsons, Jennifer (Caosi Martinez), Kenneth (Barbara), Daryl (Janet), Peter (Ceia), Gregory, Jack and Peter Wene; great aunt of many. She will be missed by her family, many friends and activists for human, environmental and political rights. A celebration in honor of her life for family and friends will be held September 30 from noon to 2PM. Those who wish to gather and celebrate Vera’s life are welcome to come together at L’Albatros Brasserie, 11401 Bellflower Road, Cleveland, Ohio.